In the heart of Gratz Park, behind a tall brick wall, lies a beautiful garden with beds of perennials, herbs, wild flowers and roses. Originally designed and cultivated by avid gardener Minnie Bullock in the early 1900's, the garden is tended to today by the Lexington Junior League Sustainers' Garden Club. They are hard at work restoring the garden to its original master plan. Most of the plant materials and bedding rocks are from Mrs. Bullock's original garden, as well as the trellis and light post. The stone for the stone bench was taken from the old entrance to the house and redesigned into the bench you see today. The renovators of the neighboring Hunt Morgan House used the bench as a pattern for their new front steps. Dr. Bullock and his wife Minnie, purchased the house in 1912. They were both avid naturalists and bird watchers that spent a great deal of time in this garden. 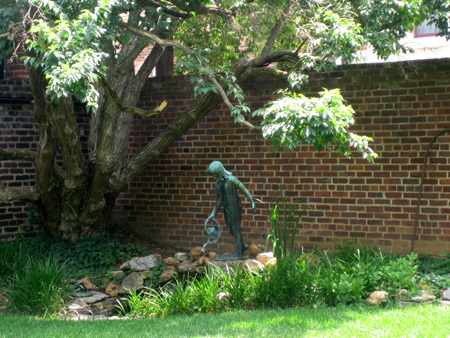 A garden statue of Rosa Tucker, sculpted by Dr. Bullock, is still a part of the beautiful grounds. 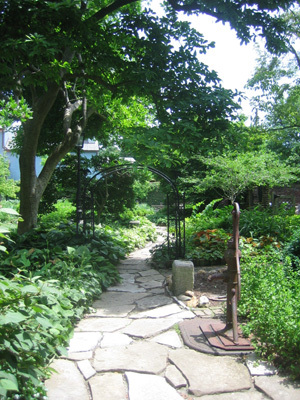 The Club, which is open to all members of the Lexington Junior League, meets the first and third Mondays, April through October, to work in the garden. Additionally the members enjoy garden-related programs, an annual garden tour, wonderful lunches, and a potluck supper in the garden!